Since 1885, Belmont Savings Bank has been serving the local area with minimum fees and maximum services in a friendly, personal atmosphere. Chartered in 1885, Belmont Savings located in Bellaire, Ohio has served the residents of Belmont County, Ohio and the entire Ohio Valley with their needs for over a 125 years! The main office in Bellaire has been at the current location since 1956. Over 4,200 people attended the open house. The next location was added in St. Clairsville, Ohio in 1966 and in 1976 Belmont Savings came to Powhatan. The fourth office opened in 1980 in Barnesville, Ohio. 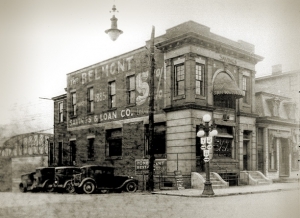 Today, one of fewer than 700 mutual savings banks left in the country, Belmont Savings Bank remains a mutual and does not have stock holders and is able to provide the community with competitive interest rates on deposits and loans. This coupled with the bank’s commitment to the local community it serves has led to significant growth over the years. The bank’s total assets are over $450,000,000 and capital exceeds $63,000,000.